Loden Foundation will be supporting 15 new entrepreneurs under the Loden Entrepreneurship Program for the year 2016. The selected 15 entrepreneurs were presented to the crowd during the closing day of the Global Entrepreneurship Week on the 18 of November, 2016. 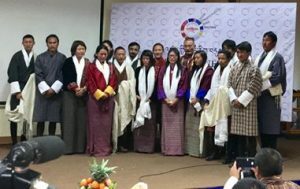 The closing ceremony was graced by His Excellency the Prime Minister of Bhutan and the 15 new entrepreneurs were offered Tashi Khadar by His Excellency. With the 15 new entrepreneurs funded for the year 2016, the total number of entrepreneurs supported under the Loden Entrepreneurship Program till date comes to 121 entrepreneurs. Over the years we have witnessed a range of diversity in the projects and young aspiring change-makers with visions, and goals. You can know more about the 121 entrepreneurs and their projects under the entrepreneurs section in our website.